Germany’s Nürburgring racetrack has become the de facto proving ground for all sorts of cars, so why not electric cars? Toyota recently took a prototype to the track known as the “Green Hell” and set a record lap time. Toyota originally set the record last year with its TMG EV P001, so it only had itself to beat. 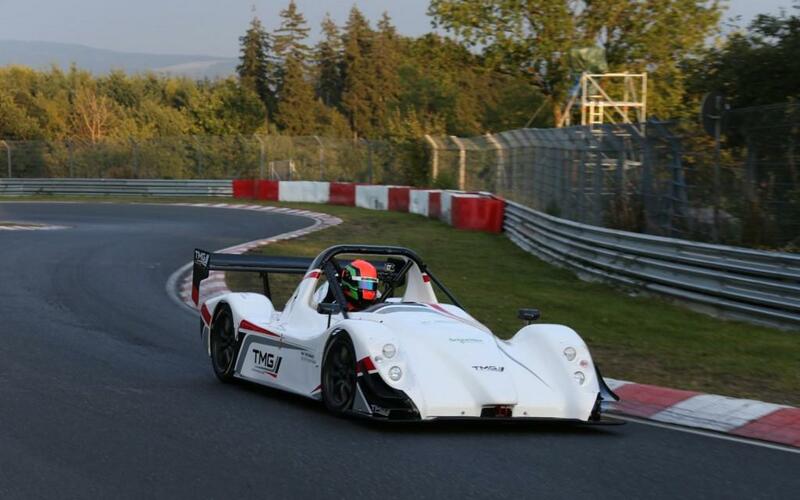 The improved TMG EV P002 set a time of 7:22.329, beating last year’s car by about 25 seconds. That time puts this prototype Toyota in the same ballpark as supercars like the Nissan GT-R, Porsche Carrera GT, and Ferrari Enzo. The Toyota prototypes look like mini Le Mans racers, so its not surprising that they set the benchmark for electric propulsion at the ‘Ring. The P002 has two electric motors and a 42-kWh lithium-ceramic battery pack. Combined, they produce 469 horsepower and 664 pound-feet of torque, propelling the P002 to a top speed of 149 mph. Complementing the new record, Toyota Motorsports unveiled an equally fast charging system for its electric cars. The TMG DC Quick Charger was designed for race teams, who can use it to charge cars in the pits or at roadside without the need for an outlet. The compact charger fits in the back of a small van and includes the same 42-kWh battery pack as the P002 car. That battery does need to be charged through a conventional outlet, but then it can be plugged into the Quick Charger apparatus to make a mini mobile charging station. The record-setting lap will certainly garner headlines, but don’t expect a version of the P002’s powertrain in any production Toyota anytime soon. The company recently announced that it is scaling back its electric car plans in favor of more hybrids. The small batches of RAV$ EVs and eQs already approved for production will be Toyota’s only all-electric vehicles for the forseeable future. Regardless, the combination of P002 and Quick Charger has yielded impressive results so far, and there aren’t any obvious challengers to dispute them. The current record for an electric production car, 8:09, was set by the Audi R8 e-tron earlier this year. However, the P002 is not a production car, so it isn’t really a fair comparison. Mercedes-Benz’s SLS AMG Electric Drive has 740 hp and a theoretical top speed of 197 mph. It weighs much more than the tiny Toyota, but the Benz just might be able to muscle its way to a faster time.